Obon is a Japanese summer festival celebration from the Buddhist tradition during which people believe their ancestors return to spend time with them on earth. It is celebrated in many ways in different areas of Japan and is a joyous and happy time. It is very family-centred. Generally people leave the cities, pack up the trains and return home to gather with family and pay respects to their ancestors. There are many rituals associated with Obon, from visiting the houses of relatives to pay respects, to having bon odori dance festivals with taiko drumming, food and the toro nagashi lantern floating that takes place at the end of Obon to symbolise the return of the spirits to their world. Who are we? 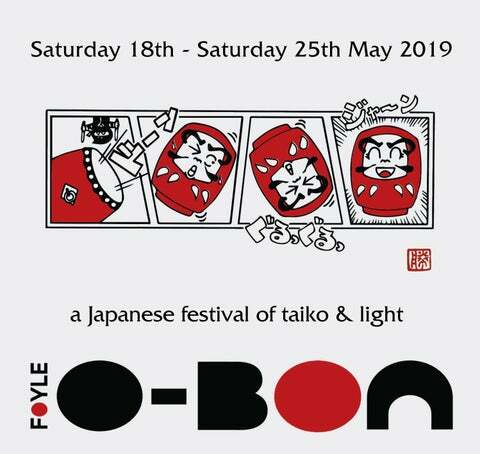 O-Bon on the Foyle is a charity organisation set up in 2014 by a group of taiko drum enthusiasts and local Japanese people. 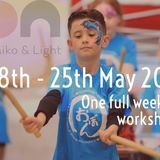 We use Taiko, Japanese dance, Manga art and our Obon festival as forces for good to improve social engagement, mental health and wellbeing and to create positive cross-community and intercultural interactions here in Northern Ireland. Our work crosses all cultural divides, breaking down barriers with its sheer magic. Irasshaimase and Welcome to Foyle O-Bon For the first time, our festival will run for a whole week. We have workshops and events happening all across the city from Saturday 18th May which will culminate in our annual showcase festival in the Playtrail on Saturday 25th May. At the heart of O-Bon we celebrate family, community, taiko drumming, dance and food. The whole festival is a colourful feast of rhythm and lights. Come to The Playtrail for an evening of Japanese culture and fun! The night will end with a beautiful lantern ceremony in the grounds. Remember! This is an outdoor evening event. Wrap up warm! Monday 20th May Movie Night! Since 1973, San Jose Taiko (SJT) has endeavored to create a contemporary musical style while respecting taikoâ&#x20AC;&#x2122;s Japanese roots. SJT performances are fully choreographed, theatrically lit extravaganzas, bridging many styles while still resonating with the Asian soul in America. A world-class ensemble, performing extensively both nationally and internationally, reaching more than 75,000 audience members each year. Foyle O-Bon are delighted to welcome San Jose Taiko to our festival. Kindly Supported by Arts Council of Northern Ireland Project Lottery Fund.